Glaucoma is the second leading cause of blindness in the United States, making it an important public health priority. Although there are several factors that cause glaucoma, all types of glaucoma are characterized by damage to the optic nerve. This damage prevents the brain from receiving appropriate visual information, resulting in vision loss. If you experience any change in vision, contact an eye care provider immediately for a full examination. 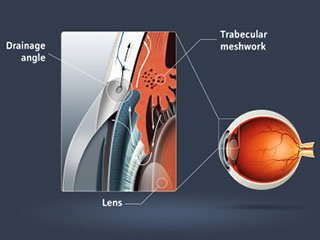 Although there are many types of glaucoma and the exact causes are unknown, the general characteristics are understood. Primary open-angle glaucoma is the most common form of the disease. This form results when the eye cannot drain fluids efficiently, leading to increased pressure in the eye and damage to the optic nerve. Changes to the blood supply fueling the optic nerve may also cause optic nerve damage, resulting in vision loss. A less common form of glaucoma, called angle-closure glaucoma, occurs when the drainage angle between the iris and cornea is blocked. This causes a rapid buildup of fluid, which can permanently damage vision within one day of its onset. Other forms of glaucoma form because of medical conditions, physical injuries, abnormal eye conditions, or medication use. Certain groups of people are at greater risk for developing glaucoma. Older adults. Individuals greater than 60 years old are at increased risk for developing the disease. The risk continues to rise slightly for each year beyond 60. African Americans and Asians. African Americans are significantly more likely to develop glaucoma than Caucasians, and that risk begins to rise at age 40. Similarly, Asian individuals are at greater risk of angle-closure glaucoma, while people of Japanese descent at a high risk of another form of the disease called low-tension glaucoma. Diabetes and cardiovascular disease. These medical conditions significantly increase glaucoma risk and high blood pressure is a risk factor for the disease. Family history. If you have one or more first-degree relatives with glaucoma, your risk for the disease increases. This suggests that there may be a genetic component to developing glaucoma. A thorough optometry exam includes checking for symptoms of glaucoma. To make a diagnosis, the eye care provider may measure corneal thickness, check the pressure inside your eyes, test changes to your vision, evaluate your retinas, and assess abnormal eye anatomy. If glaucoma is caught early, further vision loss can be prevented. Treatments commonly include medications to reduce intraocular pressure or surgery. If you have noticed vision changes, ask your eye doctor to determine if glaucoma may be the underlying cause. "I’ve been going to Dr. Anderson for over five years now and even though I only see him once a year for my annual exam, he and his staff always make me feel very welcome and take care of all my eye care needs. Anderson Optometry is the best at what they do and make you feel right at home." Does Reading in the Dark Affect My Eyesight?